Still stands the Was for aye ; its goal is won. Can ever move the Immovable. Better, happier, worthier, wiser ? Or The Permanent thy foe ! The following is less lofty. ++++++++++Es glänzen Viele in der Welt. +++++They will unravel you lucidly. +++++All their existence was vanity. Exertion, extracts for the Future the pith of the Past and the Present. +++++How it shines, shadows and flourishes ! +++++Seek we the sweet fruit that nourishes. +The last stanza is very German. Schiller compares the showy talkative man to a leaf-tree, and the plain, thoughtful, practical man to a fruit-tree. Good : but it happens that a tree with fruit is showier than a tree with merely leaves : so far, therefore, the comparison fails. Then, the connection that subsists between the final couplet and the quatrain that precedes it is not clear. You need not look for fruit among the leaves of that fine tree yonder, quoth the poet, because the whole tree springs from an insignificant kernel. How, we should like to know, is the superiority of a peach-tree to a beech-tree illustrated by the fact that an oak proceeds from an acorn ? +Forgive us, gentlest shade ! Perhaps it is in our own brains that the muddlement lies, this balmy, sleepy, June afternoon. We are again an experimentalist upon thine Iambics. +Wollt ihr in meinen Kasten sehn ? ++The Game of Life, the World in Miniature ? Ease ! Nought’s to pay— a price ’tis cheap at. ++Save by the light of Hope and Fancy. ++The Man walks to and fro, half hoping and half doubting. See how the smiling Courtier makes his bow ! And listen to the Trifler’s tittle-tattle ! The Crafty Man makes cat’s-paws of them all ! +While the losers may take their stand with their hurdy-gurdies, at the gates of the feasters’ palaces— highly honored in a nod of approval— richly rewarded by a penny. Asses they were and are. Success is not only a great thing itself, but the sole criterion of another thing not so great— Merit. ++++It had been firmness— now ’tis pertinacity. +Unter allen Schlangen ist Eine. ++Unrivalled of any for wrath. ++The Rider and his Horse. ++Is lured by the beamy steel. ++The heart of its warmest blood. ++It slays, but, in slaying, is slain ! +Wir stammen, unsrer sechs Geschwister. ++The father blithe and debonnair. ++And swore it not to fail or fade. ++And vivifies the living world. ++And Darkener, tramples down our bowers. ++We lend his throne its pomp and sheen. +Ein Gebäude steht da von uralten Zeiten. ++Shall ride around it in a year. ++It soars to the clouds, it rests in the waves. ++And yet it was raised by the human hand ! N. B. In the original set under their German title Parabeln und Räthsel (“Parables and Riddles”) the versified riddles number thirteen, three of them being connected with Turandot, Schiller’s Chinese play translated from the Italian of Gozzi. In “My Bugle, and How I Blow It”, Clarence Mangan is, characteristically, trading in masks and cloaks and puns and puzzles — what one critic calls the “identitarian” aspects of the artist’s expression. By means of such masking —in Man an ancient trait, in Mangan a manifesto— the poet would playfully engage his reading public. This comic sketch was originally composed for The Belfast Vindicator in 1841, and reprinted three years later in what was a new paper on the Irish scene, The Nation. At the head Charles Gavan Duffy put up a rather bemused editorial note, for Mangan had shied from any commitment to political writing, the declared mission of The Nation. The modern reader, in imbibing the present item —a heady Dublin draught of quare ould quizzicality if ever there was one— will perhaps recognise how the author of Finnegans Wake found much to admire, celebrate and emulate in the prose, as much as in the poetry, of Clarence Mangan. MY BUGLE, AND HOW I BLOW IT. BY THE MAN IN THE CLOAK. Tönt es aus wald’gen hallen ? Tönt es aus blauer Luft ? Hör ich’s in süsser Qual. Tönt tief in’s Herz hinein. Dies Herz, bis es verhallt. The crypts of the azure air ? From the snow-enrobed mountains yonder ? From the flower-strewn vales below ? I hear it with sweetest woe ! Is piercing my heart like a lance. Till that Bugle shall cease to sound ! IF the German poet speak truth in the last two lines he had better set sail for England without delay, and assassinate ME, for I am the Bugle-player ! I plunge at once, like an Epic versifier, in medias res ; you perceive, Reader, and “give my worst of thoughts the worst of words.” Yes ; I am the Bugle-blower ; and, like Sam Slick’s cloud-blower, I am willing to blow away and “take the responsibility.” And who, you ask, is the poet ? That will I tell you instanter. The original grubber-up of the gem that I have set in gold, silver, or pewter, as the metal may turn out to the touch-stone, is, be it known to you, Justinus Kerner, man of many accomplishments — poet, physician, metaphysician, hobgoblin-hunter, widower, and weeper. He is by birth a Swabian, or, perhaps I should say a Swab ; just as we call a native of Poland a Pole. The word “Swab,” moreover, has the advantage of “Swabian” in being shorter by three letters ; and I have seen three letters take up six newspaper columns. Little did Kerner imagine the first evening the bugle smote his ears that the Man in the Cloak, whom he saw climbing the hill to the right, was his electrifier ! Up went his dexter ogler along the rocks, and there encountered— a goat : him the poet did not for a moment suspect of practising on either of his own horns ; and so down went his sinister peeper to the flood below, where, however, it was at once rebuked by a corpulent codfish, whose interrogative eye appeared fixed on “the first demonogolist in Europe,” with a library of wandering questions in the pupil thereof. I, my cloak, and my bugle, meantime, had vanished for the night. Pretty considerably bewildered, my Swab toddled homeward to his attic, and over a second tankard of heavy wet composed the stanzas I have quoted. I confess, nevertheless, it has always appeared to me singular —I would say shameful— that neither during the concert of that nor of any subsequent evening did Kerner seem to recognise me as the musician. True it is that I wore a cloak a quarter of a hundred weight, with expansive wings at the sides, and a hood that hung down from the head, obscuring the light of my countenance ; and bugle-players are generally less cumbrously clad. But still it is difficult for me to acquit him of hoggish stupidity if I suppose that his suspicions were not at intervals directed towards me. Indeed, the very circumstance of a man’s walking about and perspiring under such a peculiar cloak, ought, alone, to have been sufficient to convince him (the swab) that there was a mystery of some sort connected with the perspirer ; and had he only trundled up to me and put the interrogatory — “Man in the Cloak, art thou he ?” I would have responded to his sagacity by nobly, and without all disguise, flapping my side-wings in his physiognomy and treating him to a blast that would have shaken him to the centre of his system. I was one day —very recently, indeed— recounting this adventure, with slight additions, to my friend, the King of the Sicilies, when an Englishman near me, who had just been admitted to the horrors of an audience, turned round, à la Jacques Corveau, and stared at my cloak from hood to hem in the rudest manner through his lorgnette. “Pray, sir,” he asked, “are you celebrated for anything besides wearing a cloak ?” Every hair in my moustache quivered at the ruffianism of the fellow ; but on account of the king’s proximity I restrained myself from sneering, or even sneezing. “Come, come,” interrupted the king, “no personalities ; this gentleman is a Corn-law Repealer.” (This he said, evidently not knowing the signification of his words). “A Repealer in virtue of that law of my being which compels me to play on the Horn,” said I, holding up my bugle. Here the king should thrust himself in. “What does he mean by a flash vocabulary?” said he to me in an under voice. Up flared the king, like a rocket from Mount Vesuvius. “Who talks of sulphur at this time of day ?” he cried. “What on earth is he after ?” asked the Corn-law Repealer of me, sotto voce. “He wants your opinion of the Sulphur Question,” whispered I. “I wish the devil had the sulphur monopoly from the beginning !” roared the king. This tickled the monarch so home that his good humour returned like fine weather on an April day, and he ordered in coffee, cigars, and a steaming bowl of bishop, in return for my share of which I executed an unapproachable solo on my bugle, which dissolved the entire court in an ecstacy of tears, and made the king, strong as his nerves were, instantaneously mix an additional tumbler, to save himself from fainting. Then I was at Naples — now I am in London. From sulphur to coal-gas ; out of the frying-pan into the fryer. “A bitter change — severer to severe,” as the poet Young — now, alas ! grown old in dusty obscurity — sings. I have imported myself hither free of duty — free of all duties, at least, save one, that of blowing my bugle ; and here I am, in “the great Metropolis,” though I have got no Grant (either from Government or otherwise) to place me there ; my bugle on the table of my inn, and my cloak, “fold over fold, inveterately convolved,” around my majestic person. A thousand troubles menace me — Cœlum non animam mutant qui trans mare currunt ; yet I care not. Come what may my cloak will stick to me, my bugle depend from my baldric. My cloak and my bugle I must always retain, until my last hour shall see the one rended into shreds and the other divested of its identity, melted into air, transmuted into ethereality, as viewless and intangible as one of its own melodies. Firstly.— That I am not a Man in a Cloak, but the Man in the Cloak. My personal identity is here at stake, and I cannot consent to sacrifice it. Let me sacrifice it, and what becomes of me ? “The earth hath bubbles as the water hath,” and I am thenceforth one of them. I lose my cloak and my consciousness both in the twinkling of a pair of tongs ; I become what the philosophy of Kant (in opposition to the Cant of Philosophy) denominates a Nicht-ich, a Not-I, a Non-ego. Pardon me, my Public, if I calmly but firmly express my determination to shed the last drop of my ink before I concede the possibility of such a paltry, sneaking, shabby, swindling, strip-and-pillage-me species of contingency. Secondly.— That I am the Man in the Cloak, viz. : I am not an “Old Woman,” as Mrs. Trollope complains that the Yankees would call her, despite her best bonnets, satin frocks and flounces, and corsets à l’enfant. Neither am I a lump of moonshine all out. Stigmatise me, if you will, as a Hottentot, as a Troglodyte, as a hang-a-bone jail-bird ; still, you cannot put your hand on your heart and assert that I am a make-believe, a bag of feathers, a non-ens, a bull-beggar, a hobgoblin, a humbug, a lath-and-pulley get-up, like Punch. Not at all. I do not say that you dare not, but I clap my wings, like a bantam on a barn-roof, and I crow aloud in triumph that you cannot, Public. It is outside the sphere of your power, my Public ! I am the Man in the Cloak. Mettez cela dans votre pipe, et fumez-le, mon public ! Thirdly.— That I am the Man in the Cloak. In other words, I am by no manner of means the Man of the Cloak, or the Man under the Cloak. The Germans call me Der Mensch mit der Mantel, the Man with the Cloak. This is a deplorable error in the nomenclature of that otherwise intelligent people ; and I am speechless with astonishment that they should have fallen into it. Why ? Because my cloak is not part and parcel of myself. 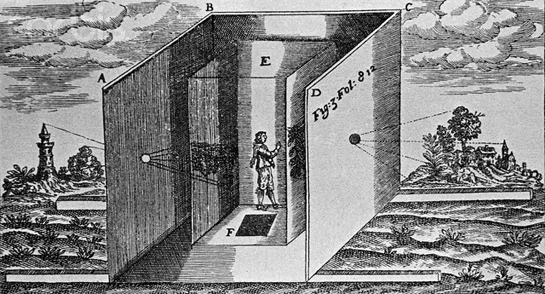 The cloak is outside, and the man is inside, as Goldsmith said of the World and the Prisoner ; but each is a distinct entity ; of that I am satisfied ; on that point I, as the Persians would say, tighten the girdle of assurance round the waist of my understanding, though, perhaps, there is no waste of my understanding whatever. I admit that you may say, “The Man with the Greasy Countenance,” or “The Chap with the Swivel Eye ;” thus, also, Slawkenbergius (vide Tristram Shandy) calls his hero ”The Stranger with the Nose,” and reasonably enough ; for, although it was at one period conjectured that the nose in question might extend to five hundred and seventy-five geometrical feet in longitude, not even the most incredulous amongst the Faculty of Strasburgh were found to advance an opinion that the nose was not an integral portion of the individual. With me the case is a horse of another colour. I do not put my cloak on and off, I grant, but I can do so when I please by a mere exercise of volition and muscle ; and therefore it is obvious to the meanest capacity (I like original tours de phrase) that I am just the Man in the Cloak, and no mistake. If any cavillers feel inclined to dispute the proposition with me further, they may await my arrival in Dublin at the Fifteen Acres. Finally.— That I am the Man in the Cloak. Other men tabernacle their corporeality in broadcloth, Petershams, Redingotes, Surtouts, Macintoshes, Overalls, Wraprascals, Kangaroos, Traceys, Dreadnoughts. Every blunderer to his fancy or the fashion. I quarrel with nobody for his taste or want of taste. I do not approach any mooncalf in the public street with an uplifted crowbar, poker, pike, pitchfork, or pickaxe in my grasp, because his toggery is of a different order from my own. I could not do so, independent of my intuitive benevolence of disposition, I have what Harriet Martineau would call “a powerful preventive check” in my sense of what is due to the bienséances of society. On the other hand, however, I yield not up a whit of my own liberty. I am aware that in Africa and Asia people wear “cotton, muslin, and other stuffs with which I won’t stay puzzling ;” that in parts of America the run is upon blankets ; that in the West Indies nankeens are all the go ; that in Egypt the men sometimes carry their duds under their arms. But am I, therefore, to ape their example — to become an African, an American, a West Indian, an Egyptian ? I see not the decillionth part of a reason for doing so. I call Europe to witness that I shall never do so as long as I have my cloak. In a case like this I laugh at coercion and despise the prospect of torture. What did I buy my cloak for ? Why did I pay fifteen shillings and sixpence, besides boot, for it to a Jew hawker of old rags, but that I might don it, and never doff it, I should be glad to know ? With which specimen of my Wit and Wisdom (N.B.—I am not the father of all the jests in the book that goes by that title), good Reader, I bid you farewell for the present. Once again, Reader, farewell, but forget not—THE MAN IN THE CLOAK. ++++++++ Oh, my spirit’s flickering lamp, art thou ! ++++++++ To the whispers of despondence now. ++++++++ But, cold world, I will not die thy slave ! ++++++++ Pleasure, passion, thirst of power and gold ! ++++++++ Of the consecrated few of old ? Sacred flame—which art eternal ! +++ Oh ! bright essence ! ++++++++ Thou, Enthusiasm !—forsake me not ! ++++++++ Shed its glory round my clouded lot. and the downright cryptic ignotum per ignotius : "It can be found in a class with a Writing Master" (Fernando J. Soto). The "Writing Master" is another name for the bird called the Yellowhammer or Yellow Bunting, whose eggs have the natural appearance of being inkily stained and scribbled upon. The taxonomical "class" is Aves. There looms through these pages a worthy wraith named MANGAN (first syllable stressed, the 'g' hard and voiced, not as in standard 'sing', 'sang', 'sung'). To any reader who is receptive to it, much may be vouchsafed that is strangely rewarding, and oddly familiar for style, in the poems of James Clarence Mangan (1803-1849). 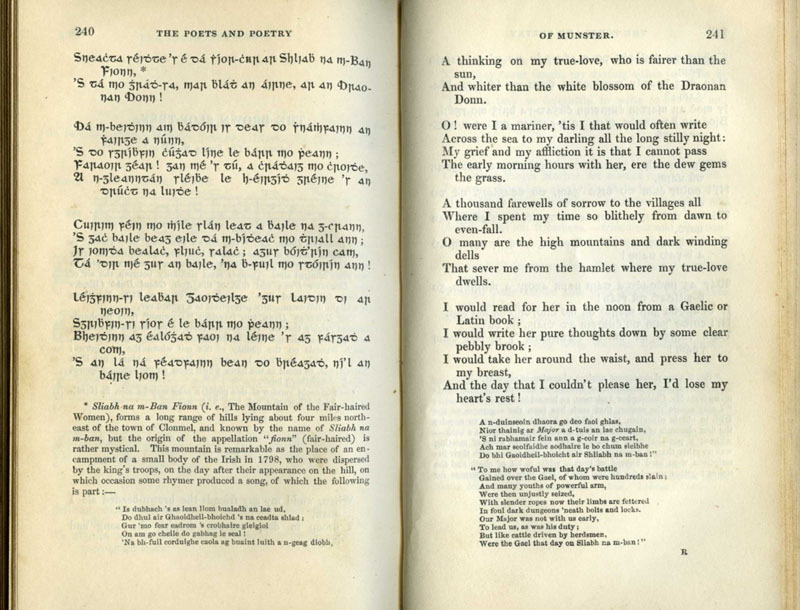 This Victorian bard of Ireland is known in his native country for only a couple of poems, "Dark Rosaleen", an allegorical Nationalist ballad, translated from the Gaelic, which is often assigned to schoolchildren for memorising, and "A Vision of Connaught in the Thirteenth Century", an original poem in the bard-seer's mode of the aisling genre. Clarence Mangan is otherwise quite neglected, even though he has deeply and directly inspired some rather famous writers who acknowledged their debt, among them W. B. Yeats, James Joyce and Shane MacGowan (of Pogues fame). 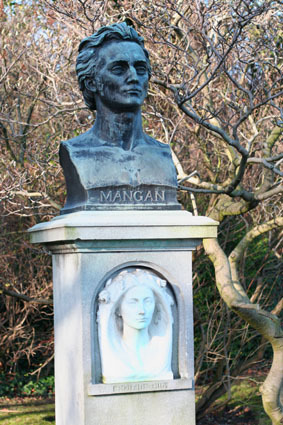 Mangan's verses have been compared (favourably and not) with those of Coleridge, Keats, Shelley, Byron and Poe. A parrot's curt complaint ("Lamii's Apology For His Nonsense"), a philosophic "Ottoman" discourse in the sand from Freiligrath's Wüstenpoesie ("My Themes"), and a pastoral idyll translating Rückert ("Nature More Than Science") : these are but a few works of the elusive Hibernian that are currently seen in this paper. Essays in Prose and Verse by J. Clarence Mangan. The Prose Writings of James Clarence Mangan. The travelling skull of Jonathan Swift. LAMENT OVER THE RUINS OF THE ABBEY OF TEACH MOLAGA. THE MAN IN THE CLOAK. Enter your email address so as to follow this paper and receive a note when each new post is published.